* Than a typical kitchen oven when reheating precooked frozen chicken nuggets. An attractive and convenient addition for your countertop. 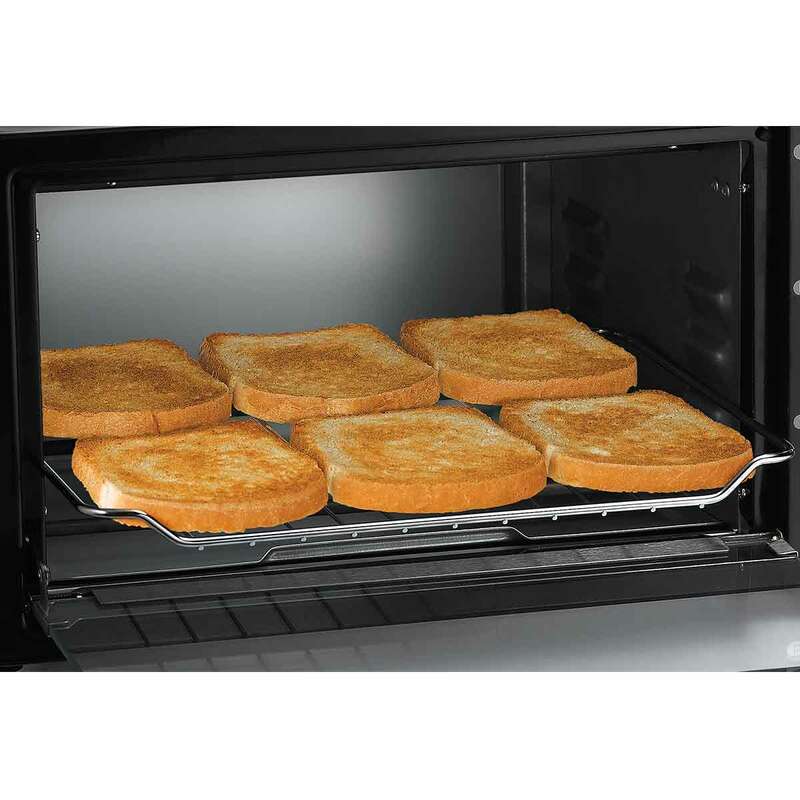 Toast, bake, broil and warm without ever turning on your full-size oven with the stylish Hamilton Beach® Toaster Oven. 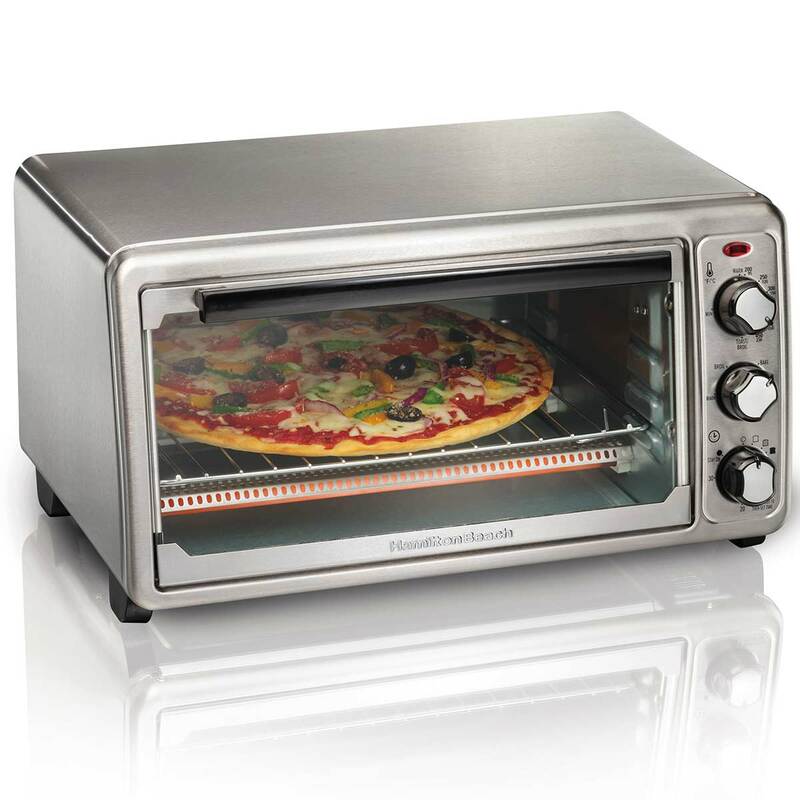 Perfectly sized to fit a 12 inch pizza, but not too big to be a countertop mainstay, this toaster oven’s large capacity and four cooking settings gives you the flexibility to make just about anything. With a stainless steel exterior and curved front, this oven will be a sophisticated staple in your kitchen. Easy to use dials allow complete control of temperature, timer and toast shade. Choose from a 30-minute timer or a stay-on setting that’s perfect for when you’re batch cooking. 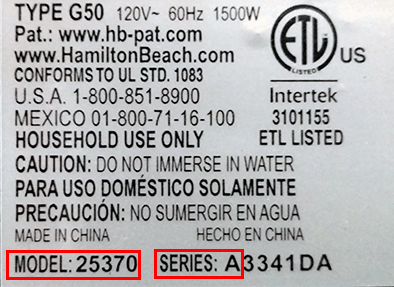 There is also a ready bell and automatic shutoff feature. The oven comes with its own pan for broiling or baking, and offers three rack positions for better control when cooking or reheating your food. Designed to be an impressive addition to your countertop, this toaster oven has a modern, sleek appearance thanks to the stainless steel exterior and stylish curved front. Easy to grip knobs make selecting your settings quick and effortless. Use the toast feature to prepare perfectly crisp toast, or make a batch of chewy, chocolate cookies with the bake setting. And to melt cheeses or brown fish, you’ll want to use the broil feature. Keep your finished food nice and hot until you’re ready to serve with the keep warm setting. 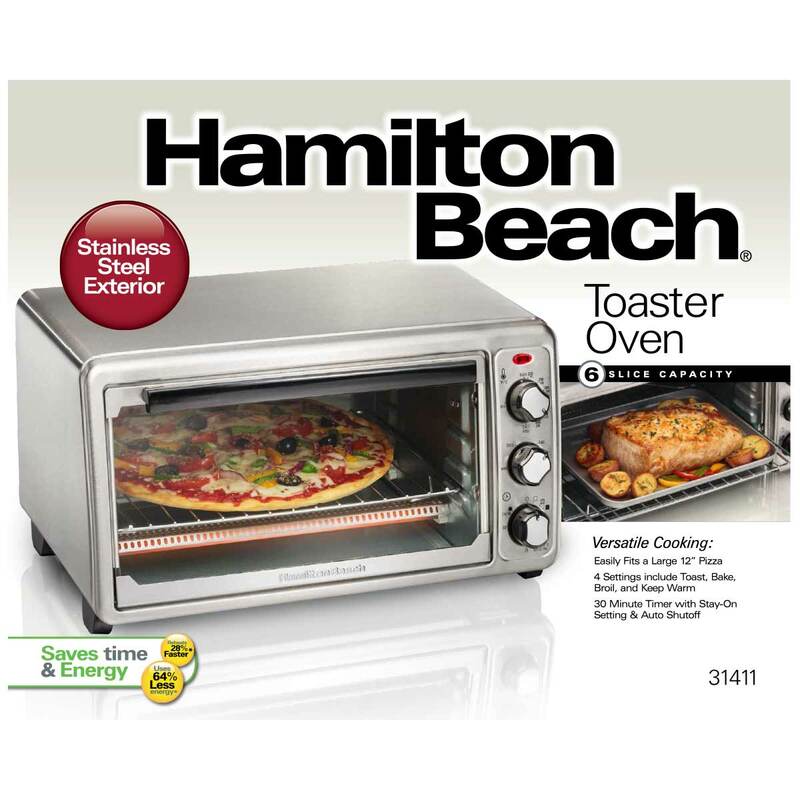 From French fries to sheet pan suppers, the Hamilton Beach® Toaster Oven can accommodate the foods your family makes for every kind of meal. It can easily hold up to 6 slices of bread and fits a 12 inch pizza. 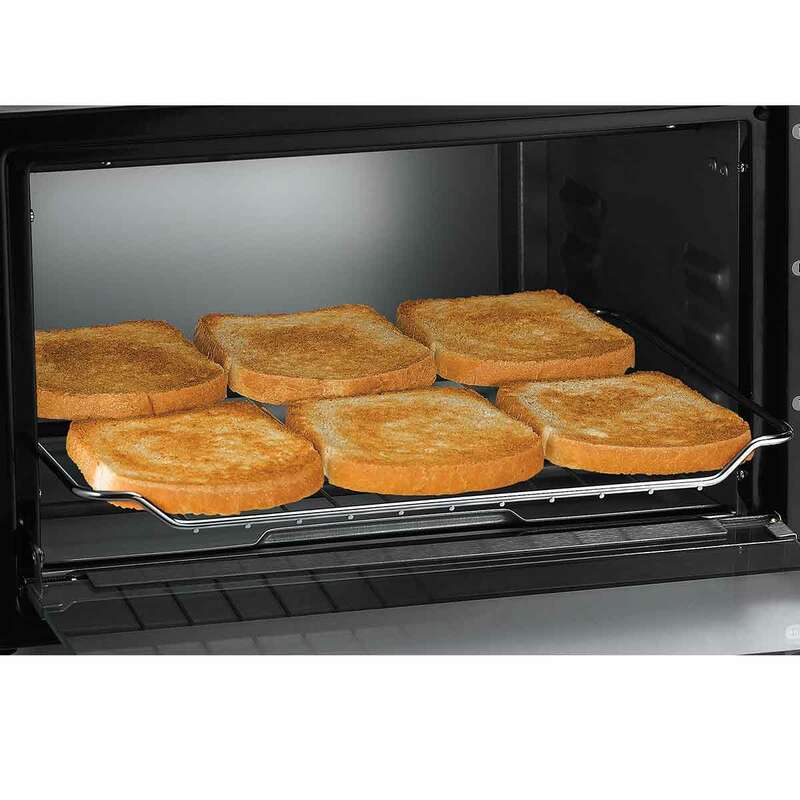 Just like a conventional oven, this toaster oven features 3 rack positions so you can adjust positioning based on food height or cooking setting. Use the lower rack for baking, the middle one for toasting, or the higher rack for broiling. A bake pan and bake rake are included.